Volunteers are needed to help on the weekend of the event and can sign up here. Check out their Facebook, if you’d like to make make a donation here. For more information about the RVA East End Festival 2018 or to , contact rvaeastendfest@gmail.com or visit their site here. 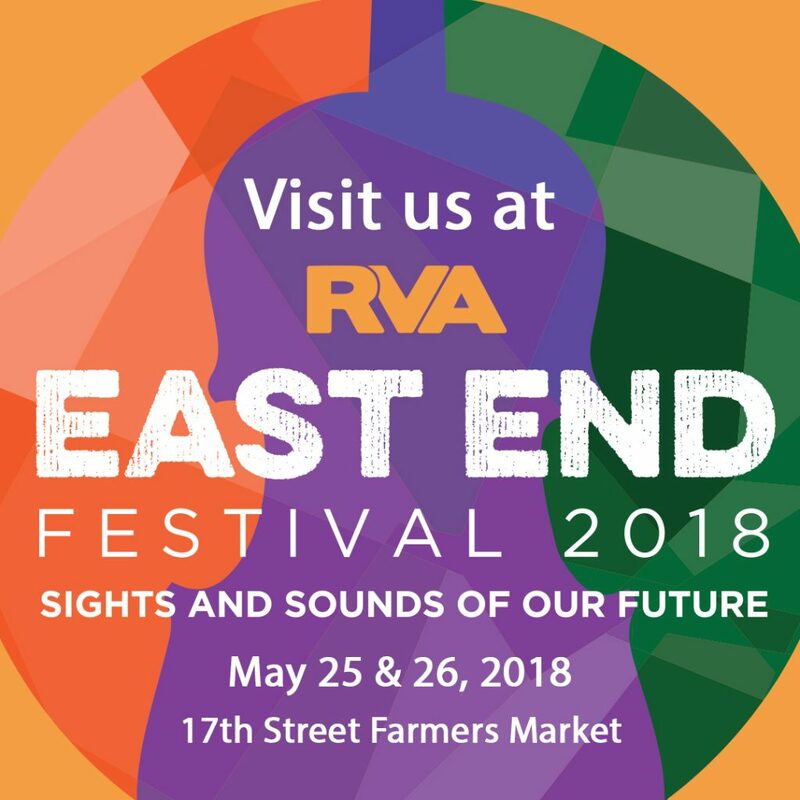 A nonstop extravaganza of music, arts, food and fun is planned for the RVA East End Festival 2018, returning for a third year on Friday, May 25 from 5-9 pm and Saturday, May 26 from Noon-9 pm at the 17th Street Farmers Market. The theme, “Sights and Sounds of Our Future,” promises a sumptuous feast for the senses during the Memorial Day weekend. This free family event features two packed days of exciting arts and musical performances by local professionals as well as some of RVA’s talented youth musicians, dancers and visual artists. Attendees also can browse among many food and beverage vendors, along with exhibits of sponsors, boutique businesses and other community organizations. Special attractions for kids include Paw Patrol characters, RVA Hoop House, Jenn B-The Balloon Lady, and PBS Kids Ready to Learn. The Brass Quintet and a String Ensemble from The Richmond Symphony Orchestra will kick off the event on Friday at 5:00 pm, followed by an eclectic mix of stage performances over the two days that are too numerous to list. A full list of artists performing at the festival, along with the vendors and exhibitors, can be found at www.rvaeastendfest.org. Proceeds from the festival support the music and visual arts programs at the following Richmond Public Schools located in RVA’s East End community: Bellevue Elementary, Chimborazo Elementary, Fairfield Court Elementary, George Mason Elementary, Woodville Elementary, Martin Luther King, Jr. Middle School, Armstrong High School and Franklin Military Academy. “As a result of the inaugural festival in 2016, East End elementary schools went from seven violins among them to enough instruments for a full classroom set of string instruments in each school,” said the Reverend Marilyn Heckstall, pastor of Asbury Church Hill United Methodist Church and 2018 festival chair. She noted that other uses of financial resources from the past two festivals were to purchase new gowns and tuxedos for music groups at two schools, as well as buying and repairing band instruments. “Our goal for 2018 is to exceed $100,000 in proceeds to support cultural arts initiatives in our East End schools,” Rev. Heckstall added. Bon Secours Richmond Health System, a major partner for the festival, believes that the event helps to build strong relationships among diverse community stakeholders, the East End residents and the local businesses including Bon Secours Richmond Community Hospital. “The festival creates a positive synergy that provides a sustainable foundation for leadership in this vibrant area of Richmond,” said Becky Clay Christensen, director of community partnerships in mission services for Bon Secours Richmond Health System. Other partners supporting the festival include Enrichmond Foundation, the City of Richmond,Richmond Public Schools Education Foundation, Richmond Memorial Health Foundation, FWL & Sons, Stone Brewing, Richmond Magazine and The Richmond Symphony. Individuals both inside and outside the East End community have made donations on the website and there will be a bucket collection during the festival. Last I looked the 17th Market was just a muddy road…Will it really be ready for a festival? Who is in charge of this project? That should answer your question. Maybe we should call Mayor Stoney.